Visitors who attended the Velma Teague Library Read Local Author Appearance event got a special treat when author J.J.M. Czep’s pirates from her book “Blackstrap’s Ecstasy” showed up at the event. Dressed as Captain Blackstrap Gennie, Czep asked to have some time away from these characters, who seemed to stalk her wherever she appeared. J.J.M. Czep, author of “Blackstrap’s Ecstasy,” dressed as the pirate captain, Blackstrap Gennie, at a recent event. Volunteers from St. Mary's Food Bank pick grapefruit Jan. 9, 2010. On Saturday mornings, groups of volunteers show up at Valley residences to harvest their excess grapefruits and oranges for St. Mary’s Food Bank. The 2010 Gleaning Program hopes to surpass the 2009 record harvest of 2 million pounds of citrus. 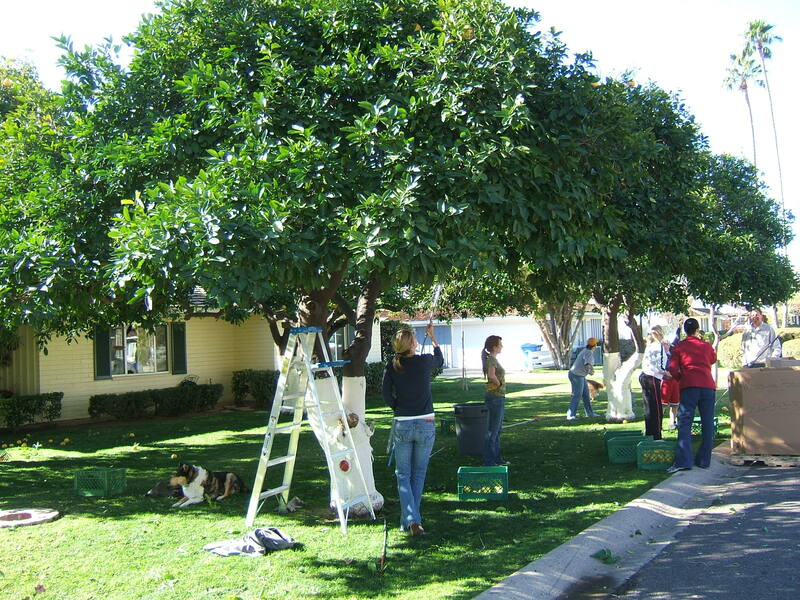 The food bank provides all the necessary equipment to pick and gather the citrus, and the homeowner pays a tax-deductible contribution of $10 per tree to have volunteers glean the fruit. On Friday, Oct. 23, colleges from the Maricopa County Community College District gathered at Mesa Community College from 11 a.m. to 1:30 p.m. to hear from eight seasoned journalists on the changes in the industry. Tim Vetscher, ABC15; Mike Rynearson, photo editor and photographer; Nick Martin, HeatCity.org; Dennis Welch, Arizona Guardian; and Le Templar, East Valley Tribune prepare to speak at Mesa Community College Journalism Editors Conference. Gretchen Berning, MCC journalism instructor, introduced the Journalism Editors Conference panel, which consisted of Paul Brinkley-Rogers, reporter; Valeria Fernandez, NPR freelance reporter; Ray Stern, New Times; Tim Vetscher, ABC15; Mike Rynearson, photo editor and photographer; Nick Martin, HeatCity.org, Dennis Welch, Arizona Guardian; and Le Templar, East Valley Tribune. The panel started the event with their backgrounds. The main thread of the conversations focused on the desire to stay in journalism, changes taking place and the diversity of everyone on the panel to adapt to the changes and carry on no matter what they faced along the way. Brinkley-Rogers the most experienced in the group and the oldest reeled off his credentials and the changes he faced over his 52 years in the business. He started in the business at 17 and worked on the staff of Stars and Stripes while in the Navy in Tokyo. Over his 52 years, he wrote for a number of publications, most recently La Voz. At almost 70, Brinkley-Rogers suffered a layoff. He said that he responded with depression for about 30 days and then he went out and travelled to Costa Rica and discovered the contrasts with newsprint there and here. When he returned to the U.S., he looked for a teaching job, and it came from MCC. He also spends time on Facebook and he spoke of the fascinating phenomena of all these people on Facebook who want to exchange information. He wants to explore this phenomena further and possibly blog about it. He says about journalism, “I think the future is still being worked out.” Sooner or later, I think there’ll be a new model. Vetscher characterizes the last nine months as a huge adjustment from reporter to multimedia journalist . He refers to his current position as “a one-man band” where he writes, gets interviews and does media on video and online, but he does everything to keep his job. Both Martin and Welch left the East Valley Tribune because of a layoff. Each struck out on his own, but in different ways. At the time of his layoff, Martin thought that his job was secure, but at 27 and with three months of severance pay he started HeatCity.org on his own and planned to make the Serial Shooter trial a big part of the blog site. He took his laptop and card to the courtroom and blogged live. Public funding requests pay for the Web site, and he says, “Very experimental, but so far, very successful.” Each time Martin requests funds, his readers and supporters deliver. “You are an individual brand,” he says. You manage your brand with a blog and a Twitter account, so you have a good way to get followers and reach out for freelance work. The social media presence is important for the next step in his career. He writes for Phoenix Magazine and became a stringer working on 100 different projects. He says it takes a lot of work to pay the bills and although he got paid very well for three days to follow Mike Tyson after his daughter’s death, he felt it was a terrible thing to do. Brinkley-Rogers and Fernandez showing their true journalistic spirit both encouraged Martin to write about his experience with the Mike Tyson story. Welch, another casualty of the Tribune layoff, decided to go a different route than Martin. With a business man and three other journalist, he became an owner and writer of The Arizona Guardian, which sells on subscription and specializes in government and political news with other plans in the works. If you go into business, go into business with a business man or woman, advises Welch. The overhead of this online presence for The Arizona Guardian is almost nothing and so we don’t need big ad revenue. The marketing campaign consisted of publicizing by word-of-mouth, possessing credentials to cover legislature, appearing on Horizon and breaking good stories. As the East Valley Tribune opinion page editor, Arizona Press Club vice president and contest chair and PVCC instructor and blog adviser, Le Templar feels blogging becomes a challenge because “almost everyone that has an opinion can express it.” He needs to find a way to get readers to come to his blog, and he tries to bridge the old and new media by balancing news in the newspaper and his blog. He makes radio and TV appearances, uses Twitter, but fails at video, so he laughingly concludes he needs to take Vetscher’s PVCC video class. Over the next 20 years, Templar wants to become knowledgable on key issues and events in the Valley and East Valley so that readers come to read his opinions. Before leaving La Voz to become an independent journalist, Fernandez had lots of front page stories and small daily stories and features. Currently, Fernandez learns to do public radio and wants to do a radio show in Spanish. She also goes out and follows local and community stories whether she has a client or not for them. She uses her Spanish and all of the other tools of her trade. “Try to surround yourself with people who are open-minded and will allow you to use your enthusiasm and put it to work,” says Fernandez. A year ago, Rynearson retired from the Arizona Republic, but he soon got bored because there was nothing to do after doing everything. He now teaches photo journalism at MCC and does freelance work in travel photography. “Now I’m busier than I was when I was working,” Rynearson says. Since the early ’80s, Rynearson says a huge change took place in news photography. Photos switched from black and white to color and then digital came along, which was a cost saving issue. When the Internet became popular, the production of photos became immediate. Slide shows came first and then videos and audio feeds into slide shows. He emphasizes there’s always a need for photos, but it depends on the media. Think outside the box, says Rynearson. Go out in different directions. Learn all you can and learn to fix computers. The industry changes daily. When you’re on location and the laptop breaks, you need to know how to fix it, says Rynearson. When photos needed to be developed, he said they’d find a place with running water and many times they’d use toilet water to rinse them. He described the innovation used to get the photos done. Stern moved from the Tribune to the New Times. The New Times wanted him to blog, and he averaged about seven blog posts per day. Recently he went back to staff writing, but he still needs to do two blog posts per day. He believes that the Internet has made everything more stressful and tougher. “My job seems tougher now than it ever has been,” says Stern. It takes a lot of time, but makes money in the Web world and print for the New Times. Paul Brinkley-Rogers, reporter; Valeria Fernandez, NPR freelance reporter; Ray Stern, New Times; and Tim Vetscher, ABC15 chat after the panel discussion at Mesa Community College Journalism Editors Conference. Book sales held at the Friends of the Phoenix Public Library warehouse. Every year, the Friends of the Phoenix Public Library hold book sales throughout the year. Even though I own more books than I will ever be able to read before I die, I look forward to attending their half price sales on Sundays since they remain the best organized and most affordable around. This weekend, Saturday, April 25 from 9 a.m. to 5 p.m. and Sunday, April 26 from noon to 5 p.m., the Friends hold another of their well-organized book sales in their climate-controlled warehouse. Volunteers greet eager book fanciers as they enter the garage door on the south side of the building, and they point them in the direction of the types of books they desire. A guide shows Melvil Dewey's Decimal System. Volunteers work throughout the year to organize the books by either the Dewey Decimal System or by categories. The books reside on sturdy metal shelves, and category signs mark the end of each shelf. Price lists also appear here and there on the ends of the shelves. Book enthusiasts find hard cover and paperback books, magazines and videos at the book sales. Books may be gently used or discards from the library, and they also carry a wide range of books for children and teens. Friends' warehouse contains shelves of books. Book lovers receive a laminated book mark containing the book sale schedule and other information when they pay for their books. Friends will hold another book sale on Oct. 24 and 25 or stop by The Friends’ Place located at the Burton Barr Central Library. Book lovers can volunteer and become members of the Friends for as little as $20. Friends have supported the Phoenix Public Library System for 30 years.